Early published D&D adventures such as Palace of the Vampire Queen adopted the same terse style. B8 25’x16’x20’H Picture on south wall depicts living battle scene. Arrow flies out of picture every 4 r. Arrows stuck everywhere. B9 25’x24’x20’H Dire wolves head E Wall has Ring of Mammal Control in nose. Stuffed Elf, Giant Ant, boar, etc. 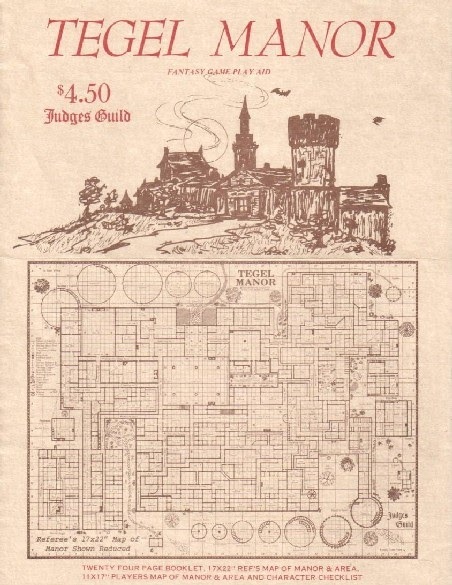 In 1978, my friend Gordon tried running Tegel Manor, but the campaign fizzled after his first session. Young Gordon lacked the experience to turn a list of creatures, clutter, and spooky effects into something fun. His manor played as a dreary slog. Gary started publishing adventures with G1 Steading of the Hill Giant Chief (1978). He included generous descriptions for every location, even the rooms with little to interest players. CHIEF’S CHAMBER: This room is hung with rugs and skins and there are hides on the floor. There is a bed, 2 chairs, a small table with a tun of cheap wine on it, an old shield and some of the chief’s weapons (in the corner), a chest with his clothing, and other clothing hanging on pegs. A thick chain (for his cave bear) is set into one wall. Nothing of value is in the place. Gary’s longer descriptions set the pattern for virtually every adventure to follow. B8 BEDROOM (25’x16’x20’H): Opening into the side hallway that leads from the Master Gallery to the Whistling Hall, this room would appear to have been trapped, and to have claimed a victim already. The door stands ajar and a corpse sprawls partway out into the hall, with an arrow protruding from its skull. Two more arrows are lodged in the wall beyond. Any who examine the room further will find a fascinating sight: The wall opposite the door is entirely covered by a vast depiction of a fearsome battle scene—and the picture is alive! Not only does it continue to move, but every fourth turn another arrow flies out of the picture in a random direction. The other walls of the room bristle with arrows stuck in the woodwork, the bedding, other pictures (one of which—a portrait—is bleeding!). Longer descriptions free DMs from a need to invent details at the table. Even if you have a knack for description, the ideas that spring to mind first will steer toward the obvious—likely the most familiar and blandest ideas. The update turns the curiosity of the arrow-shooting picture into a possible trap for players to investigate. The bleeding portrait adds another spooky detail. The fuller description makes the room more fun than the version Gordon ran. On the other hand, the description of the taxidermist’s bedroom adds some color, but little play value. B9 BEDROOM (2S’x24’x20’H): Entering this room off the Master Gallery, one is immediately overcome by the strong animal musk that clings to the chamber. A stuffed elk stands in one corner, while heads of boar, dire wolf, great cats and other fierce beasts fill the walls, along with hunting bows and spears, all heavily layered in dust. How one could sleep in such a room without keeping a bonfire going is questionable, especially since the eyes of all heads seem to glimmer and follow you around the room. This description takes a good, middle sentence and pads it like a school paper stretched to an assigned length. The custom of longer description encourages authors to write something even when they have little to add. The format makes authors feel obligated to describe the shelves and pegs in an empty closet. I have quotes from published adventures. Don’t force me to include them. A location’s purpose in the game should also figure into the length of its descriptions. If the player characters meet the sheriff about a wanted poster, no one needs an item-by-item inventory of her kitchen. Even the kitchen in the giant chief’s steading only merits a sentence. In the unlikely event that players care about pots and pans, Gordon can improvise. The Curse of Strahd adventure lavishes detail on every location. The homes of notable NPCs get pages of room descriptions. To be fair, players might explore some of these rooms and author Chris Perkins fills them with creepy, moody details. But unless your players treat social calls like dungeon crawls, they will never enter the Burgomaster’s scullery, much less care about his spooky spatula. As I read the adventure, many locations interested me until I considered how players might experience them. Often then, I realized that nothing would bring players to the location. I wonder if any DMs led players to explore village houses like dungeons because the places’ descriptions seemed to invite that mode of play? Even though I seldom read-aloud text verbatim, boxed text consolidates and identifies features that require description. I like box text, but not every location needs it. Curse of Strahd includes it for every location. The descriptions are evocative, but DMs who dutifully present the box text for all the empty rooms in a place like the Argynvostholt dungeon will bore players. Clearly, writing box text for the endless, gloomy rooms in Curse of Strahd caused Chris Perkins to collapse weeping into his keyboard. His follow-up, Storm King’s Thunder, omits almost all read-aloud text. Find a happy middle, Chris. 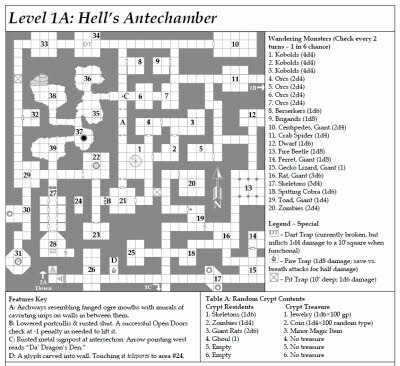 Even a novice DM could run Stonehell cold, but I wonder if the sparse details offer enough to bring the adventure to life. My ideal dungeon description would adopt the best of both worlds. I want a map overlayed with notes and matched with an abbreviated key on the same page. At the table, the short key offers an easy reference. The latrines, empty bedrooms, and such can get the one line they deserve. More interesting locations can break out into a second, expanded key. The length of descriptions should match the way players will engage a location. If sofas, throne-like chairs, and urns appear in the kindly widow’s salon, skip the box text. If they appear in the Tomb of Horrors, keep typing. Descriptions should focus on telling details and plot-critical information—details I can use in play. Don’t bury the evocative bits in lavish descriptions of sleeping pallets and rubbish. If your kitchen description seems like the first thing a typical DM would imagine at the table, you may as well rely on the typical imagination. How much description do you want in a dungeon key? This entry was posted in Role-playing game design, Role-playing game history and tagged Bill Owen, Bob Bledsaw, boxed text, Castle Greyhawk, Chris Perkins, Curse of Strahd, Dragon magazine, G1 Steading of the Hill Giant Chief, Gamescience, Gary Gygax, Judges Guild, one-page dungeon, Palace of the Vampire Queen, Rob Kuntz, Stonehell, Storm King’s Thunder, Tegel Manor, Tomb of Horrors. Bookmark the permalink. 5 Responses to How much description should a dungeon key include? I suspect part of the longer frivolous text comes from $, but some of it probably comes from the common concern of the era: if something is being described, it must be important. So you get players picking up, not from what the gm says, but how he presents things where the hidden treasures or traps, or secret passages are. Now days I’m not sure that’s a problem. Why exactly would I want the players wasting 3/4 of the session tearing up bedrooms, closets and other areas of no interest or missing the magic gewgaw or clue in the actual room of interest? But that seemed critical back in the day. Entire forum threads (both magazine and online) were devoted to the subject of making sure your players paid the boredom tax as it were. I used boxed text for a long time as a DM, reading it just about verbatim. Some of that may have been due to organized play and the old 3E-era concept of “every table should run consistently.” But, I think a lot of it was that I just found it to be a nice routine and a stable grounding way to start a scene. Organized play now encourages DMs to adjust the adventure, and I’ve grown to enjoy mixing it up. I use about 50% of what might be written and modify or ad-lib the rest. I find it helps me connect more with the players. At the same time, I really like reading boxed text as I prepare, and I like how it sections off player knowledge vs DM knowledge. I similarly like a “Developments” section for things that change during the encounter, and for important encounters, a “Tactics” section. I want to be able to find things. So, I do want boxed text for important encounters, and I’m okay with a medium or even slightly longish length. As a writer, something I’ve tried to learn is that if boxed text is too complete, it leaves nothing but obvious questions and obvious action. And, it does the DMs job – they read and have nothing to do but wait for the obvious action. Bandits: PCs fight them, DM calls for init. Chest: check it for traps and open it, DM reveals the expected resolution. I think a better approach is to find how to write boxed text that creates/facilitates interesting play by both the player and GM. Chris Perkins’ DM column had some great ideas and examples on this, where at the end of the boxed text the players and DMs immediately will start going back and forth with questions and developments. Either in that or another column, Chris had the example of your quest giver showing up at the tavern, and falls onto the table, a dagger buried in his/her back. Immediately the players will be super-interested and being an interplay with the DM that could go in many directions. Shawn Merwin does this really well with many of his introductory Adventurers League adventures. That’s, to me, what I most try to do with boxed text these days as a DM or author. You’ve opened my eyes to an unseen side to box text. I need to seek out the Chris Perkins columns. I think I missed them when they originally appeared. I remember playing a recent AL adventure where the patron gave the players a mysterious bag and then died. I loved that hook! I both hate and love boxed text. I love it because, when written well, it can succinctly identify what the party experiences when they enter or interact within the location. Like many older gamers, I prefer the terse text that limits the description to what the characters see, smell, or hear… and not what they might deduce or interpret. If the location lacks a monster, then it provides players the opportunity to either explore or recuperate. I hate boxed text because it is (too) often poorly written. Many DMs and designers fancy themselves as writers. They refer to encounters as “scenes” or gameplay as “advancing the plot.” While most many disagree with me, I think that is a mistake. It’s the result of authors translating the game in relativist terms. While writing and designing an adventure seem analogous, it doesn’t make them the same thing. Games, and their needs when designing them, are different than fiction. Too many people do not discern that difference, and too many do not modify their writing to fit the needs of the game. The result of which is the laborious prose we see in adventures. Whether it’s adventure backgrounds or room descriptions, it’s usually too much. And, as demonstrated, it’s often the wrong type of information that’s imparted. Curse of Strahd is an good example. On the other end of the spectrum, I find Storm King’s Thunder barren. As a DM, I don’t have time to fill in all the gaps that the creator left out. That’s what I’m buying the product for: a complete adventure, not one where extra work is required on my part to flesh out the descriptions. My expectation is that a DM should be able to crack open an adventure and be able to run it without anything other than a preliminary read. Anything other than that means the product is incomplete. I think you bring up an excellent point, in that: should the length of descriptive text mirror the needs of the room or encounter? The obvious answer is “yes.” Unless there’s something relevant to the current room, or other rooms (or encounters) — not “plot” or backstory — then the extra content is superfluous. Does it matter that the owner of the Blue Water Inn isn’t getting along with his father? No. Do any of the encounters, as written, present any impact on the players that Izek is Ireena’s long-lost brother? No. Does the adventure even hint at how to reveal that connection to the players? Oddly, again, no. So what is the point of all that then? The object of an adventure should never have to be to uncover storyline threads unless that is the sole objective of said adventure. Anyway, it’s apparent I have strong feelings about it. It’s not meant to bash anyone else’s opinion. I simply think that there are very few adventures with which to properly template what works best for DMing. If we had more good examples, we’d likely to have less disparity on the opinion on the matter. While every DM may handle read-aloud text differently, based on their creative proclivities, the fact is that there is better-written read-aloud text than others. I like the shorthand method that you wrote about previously, but I find that too difficult for my own purposes. I like to just read off the page, and those notes don’t lend themselves to intuitively figuring out what’s in the room. It takes too long for me to process and digest it. However, I adore the simplicity and structure. I think there is a happy medium somewhere. Excellent points. Thanks for commenting. Your comment on box text burring into fiction made me think of the cases where box text seems assume certain PC actions and then narrate those actions. Stuff like, “As you look at the altar…” or “When you open the door….” I see that as the worst form of read aloud.